As I sit down to write this article on warm January day in Northern New York, I think back to last spring and how the seasons’ successes and failures played out. A particularly common theme to last seasons’ hunts was smart phone technology. I have always been a big advocate of using mapping programs, game cameras, and anything that would give me an edge in the spring woods. However, last spring I landed a new 750 acre farm just days before the season opened and my schedule didn't allow me to walk it and scout it as I traditionally do. My smart phone helped me tremendously while speed scouting and hunting this gorgeous turkey factory! Coupled with the use of a couple of key apps and some luck I was able to take a great tom opening morning and guide friends to four more gobblers on this piece of land. Before I start, let me just say, I am in no way affiliated with any of the technology companies I'm going to mention. I am just sharing my opinion on some things that might possibly help you this spring. What I've listed above is what I have on my phone that has helped me in some way in the spring woods. There are plenty of free apps or "lite" versions of apps as well that will serve the same purpose, but I'm only going to write about what I have used. All three of these apps are also available for Android phones as well. The nice thing about these apps is that they don't require cell signal to operate, they use the GPS signal on the phone to load maps and function, which make them a great option in back country areas. The Google Earth app is useful in the fact that it gives you high quality satellite images of earth with the option to pinpoint your exact location. Unlike the desktop version you cannot drop pins or mark locations, but remains a useful tool to see the area surrounding you. The Turkey Scouter app is very cool. It is packed with tons of features. It has on screen wind speed and direction display, weather display, the ability to pin point your location and many GPS way point types. This app is useful when scouting, hence the name because it allows you to mark points of interest that are turkey oriented such as: dusting sites, tracks, roost trees, sightings, kill spots, where you heard gobbles, camera sites, food sources, scratching, strut zones, water sources, as well as set ups. Each point plotted also has the ability to have notes or photos added to it. So if you were to scout a property load all this data into it, you could then zoom out and hopefully figure out a pattern for the turkeys on your property. The map portion uses high quality satellite imagery which was updated in May of 2011. The Cabela's Recon Hunt is a versatile app for hunting anything. This was the first app that I used to aide me in turkey hunting. It uses the same updated imagery as the Turkey Scouter app and does not require cell service to run most of its features. The user is able to mark waypoints of different varieties. The user has the ability to change the maps available from satellite, street, topographical (contour lines), or terrain. There is also an added package that shows public land boundaries for some states which would be super useful for public land hunters. This feature is not available for every state. The app allows the user to log trips so you can see where exactly you traveled that last outing. A neat feature available is a ruler to measure distances on the map, which is useful when trying to determine if you can beat that tom to a forest opening! This app is feature rich, including the ability to make gear lists, ballistic data, blood trailing options, compass, moon & sun tables, weather, photo upload, and map caching. I primarily use these apps when scouting and running and gunning. I still believe there is no substitute for scouting the areas you hunt thoroughly. 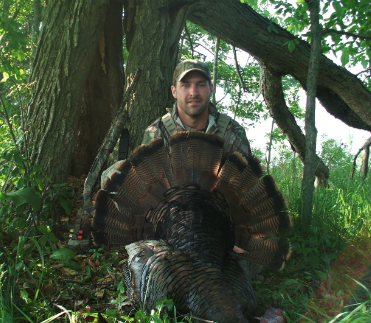 Firsthand knowledge of the land is something I believe in and why I am successful every spring. With that being said, these apps may help you get into position to cut off a gobbler or to reposition on a bird that may be hung up. They are also useful in narrowing down your scouting area, as knowing where to concentrate your efforts is important to the turkey hunter with limited time. Remember these are not necessary to kill turkeys, but it just may give you that edge you have been needing to pull it all together!